In a large sauté pan cook the bacon until crisp. Transfer it to paper towels to drain. Remove and discard the dark green outer leaves of the frisée and separate the pale yellow inner leaves. Wash, spin dry and set aside. Toss the frisée with a tablespoon or two of the vinaigrette and arrange on 4 chilled plates. 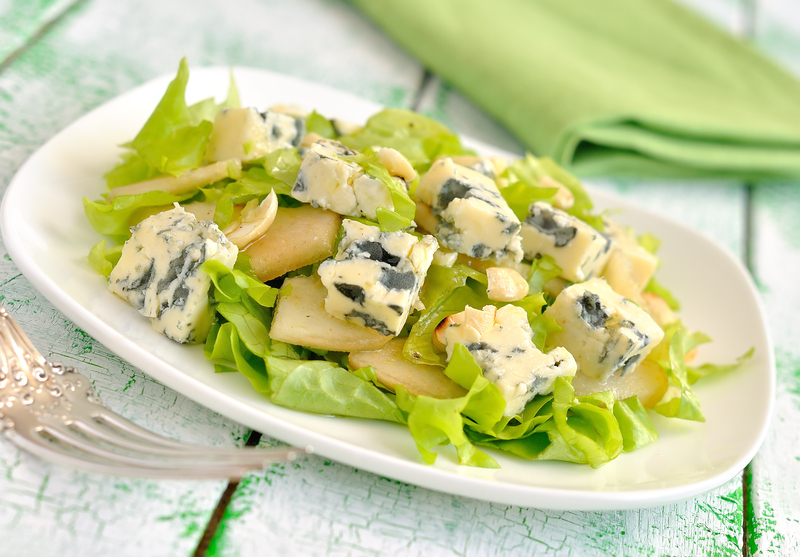 Attractively arrange the apples, blue cheese and bacon around. Drizzle remaining vinaigrette over and serve immediately. Maple Vinaigrette Makes 1/2 cup Heat the maple syrup slightly in the microwave or on top of the stove and then whisk in the mustard, shallot and vinegar. Continue to whisk and slowly drizzle in the walnut oil to form a light emulsion. Season with salt and pepper. Store covered in refrigerator for up to 3 days.